The 'transverter' (transmit & receive converter) was designed to work with a Yaesu FT707 transceiver, operating at 10 MHz. All of my best DX QSOs were made using this set up. More recently, I have modified the transverter to interface with my IC756PRO. The transverter used by G3YMC for use on 136kHz transverts to and from the 10MHz amateur band. This band was chosen primarily because 10MHz computer crystals are cheap and readily available. The transmit section of the transverter consists of a mixer, low level driver stage, MOSFET power stage and output matching and filtering. 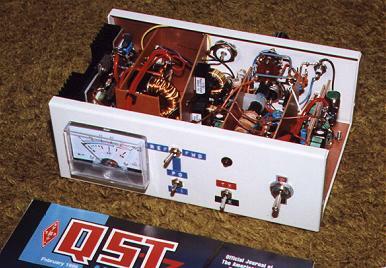 The transmit mixer is mounted in the same box as the receiver.